Initially the trees are weakened by factors like extreme drought or insect pests. This makes them more vulnerable for pathogens, which then can enter the tree and either cause chronic disease or a rapid dieback. 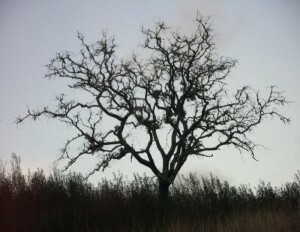 The course depends of the kind and the amount of the pathogen in question and can – in the case of the most aggressive pathogen, „Phytophthora cinnamomi“ -cause death within several weeks. Prophylaxis plays an important role in the inhibition of this disease. This includes especially to avoid the cleaning of the land with big machines, because in the course of this „Limpezas“ contamined soil particles can be distributed. We can give you advice in this case and show up alternatives. Once infection foci are present in a stand it will be necessary to determine the kind of disease to be able to fight its causal agents. 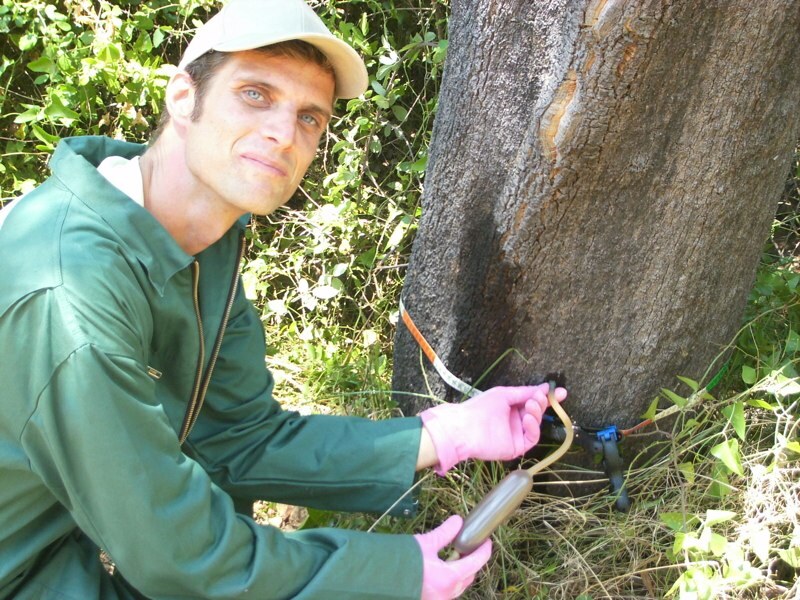 In this case a fungicide substance, effective especially against this pathogen, is injected directly into the trunk of the infected trees. An injection is placed every 10 cm. This injection makes sure the direct reception of the substance into the metabolism of the tree, as well as the restriction of the effects onto the treated plants. – living spawn of ceps (Boletus spc.) and chanterelles (Cantharellus cibarius) originating from the Baixo Alentejo. With their hyphen these simbiotic fungi form a dense net (‘Hartig’s net’) around the root, which defends the latter very effectively against root pathogens as Phytophthora. Moreover one day a yield can be expected. – mix of soil bacteria which act directly antagonistic towards Phytophthora. This dilution is inoculated into the soil on twelve poits around the tree. Other pathogens, like Biscogniauxia mediterranea – the agent of the charcoal disease can additionally be limited by hygienical means , like the elimination of infected branches, to reduce the present amount of the pathogen. A massive insect infestation can also contribute to the death of a tree. If, and in which way it should be reacted to an infestation depends of the species and the size of the population. As in the most cases the disease is caused by a combination several agents, we offer an integrated approach. In the end the choice of measures has to be worked out on the plot, together with the landlord and in dependence of the concrete situation. We have prepared a Power Point Presentation on this task for the information of forest professionals, students and interested public that we can present on demand.